You shouldn’t have to be concerned about what you are breathing around your home, especially when you are trying to get a good night’s sleep. An air purifier can remove most of the smaller particles in the air so you can breathe more easily. A HEPA air filter filters the airborne contaminants from the air, and is ideal for mold, pollen, dust, and many airborne bacteria. Carbon filters are great for catching larger particles and neutralizing odors and gasses. The Levoit air purifier is a true-HEPA purifier that can eliminate up to 99.97% of airborne smoke, pollen, dust, mold, and pet dander. This purifier uses technology that is highly effective for purifying air and doesn’t produce ozone, unlike most electronic air cleaners. The Levoit purifier has an intuitive control panel that is simple to set up and easy to use. You can customize your settings, such as the fan speed and the timer which allows for up to 12 hours of clean air in your home. You can also set it to sleep mode which lets you sleep peacefully while breathing fresh air. The HEPA filter removes mites, dust, pollen, and larger particles. The activated carbon filter takes care of any lingering smells around the house, including cooking smells, cleaning agents, and tobacco smoke. For anyone who suffers with allergies, particularly with regard to pollen, dust, and animal dander, this air purifier may be just what you need. However, if you or your family members are worried about other indoor pollution types, such as viruses and bacteria, this purifier is not targeted to that use. This beautiful air purifier comes along with an activated carbon filter, a fine preliminary true HEPA filter, and a user manual to ensure you can use the Levoit purifier with ease. 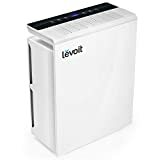 The Levoit air purifier is perfect for use in allergy season as it helps to eliminate common allergy triggers from the air, including pollen, dust mites, mold, smoke, pet dander, and other pollutants and particles that may affect your allergies. This model has a 3 stage filtration system which removes up to 99.97% of pollen, dust, odor, smoke, pet dander, and mold spores. The pre-filter, HEPA filter, and activated carbon filter can eliminate particles and air pollution that is just 0.3 microns. The Levoit air purifier is 100% ozone free, so it doesn’t use any ions or UV which create trace amounts of ozone, which is a harmful air pollutant. The smart automatic mode indicates the quality in the surrounding air and makes automatic suggestions with regards to fan speed for purifying your air faster and more effectively. The convenient and quiet sleep mode allows you to sleep peacefully while the purifier produces fresh air on its lowest setting so there are no loud or disruptive noises. For even more convenience, you can set the integrated timer to anywhere between 1 and 12 hours so that it automatically powers off after a defined amount of time. The Levoit air purifier can capture and neutralize different household odors including pet odors, tobacco smoke, and cooking smells, limiting the irritants in the air. You can use this purifier in a large room up to 322 square feet, and it takes just 10 minutes to filter the air in this space. On average, you will only need to replace the air filter every 6 months and the filters are readily available. 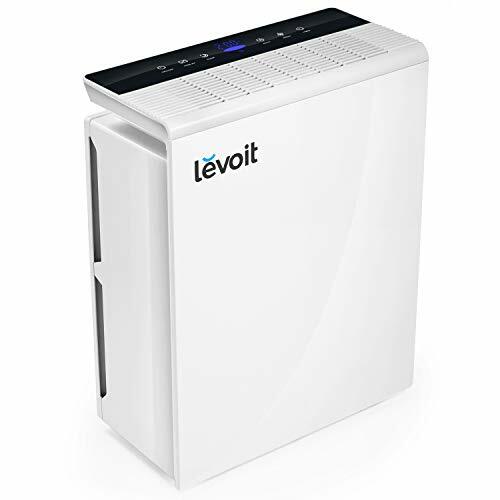 The Levoit LV-PUR131 Air Purifier comes with a 2 year warranty which speaks to the quality build and functionality of the product. The Levoit has an intuitive and simple button cluster at the top of the device which you use for quick and easy adjustments, such as the different fan speeds and air exchange rates. When you power up the purifier, its system sets the fan speed to medium as its default. You can change this using the speed button. An automatic setting can be used which enables the integrated air quality meter to regulate the fan speed based on the surrounding conditions. You can use the timer to set when you want the device to power off, and press the sleep button for use during the night. This purifier has a patented 360 degree discharge and intake that maximizes its effectiveness. Its SurroundSeal Technology minimizes any air leaks that may occur and it has 3 levels of air cleaning. Despite its compact size, this purifier is ideal for large and extra large rooms, so it is perfect for the living room or bedroom. The Honeywell air purifier can captures up to 99.97% of all microscopic allergens that are 0.3 microns and bigger. This purifier is a great option for most homes thanks to its powerful yet quiet air cleaning performance. You can easily integrate this product into any room in your house for fresher, cleaner air that will keep your family allergy free.